Recette en anglais, recette de cuisine française, Gratin dauphinois in the french cuisine with the Pierrette’s guide, recipes of gratin dauphinois and other recipe gived with the purchase Pierrette’s guide, or purchase alone. visit the web site : www.cuisine-francaise.org/book You can buy 85 recipes of pierrette’s guide for 9,99 € with paypal, contact us : www.cuisine-francaise.org/book, but recipes gived with the purchase Pierrette’s guide. Grease the gratin dish with the margarine. 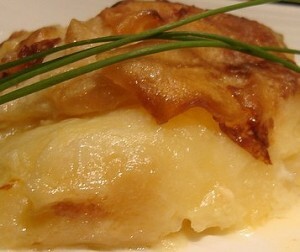 Place the first layer of potatoes in the dish and then a layer of cheese and so on. Salt and pepper. Mix together the milk and crème fraîche and pour the mixture over the potatoes. Cook in the oven for 60 minutes at 400°F (200°C). This site is so FANTASTIC guys!